Oh, did you notice the cute girl with green hair topped with a pretty bow in the cage? She’s protesting animal cruelty. 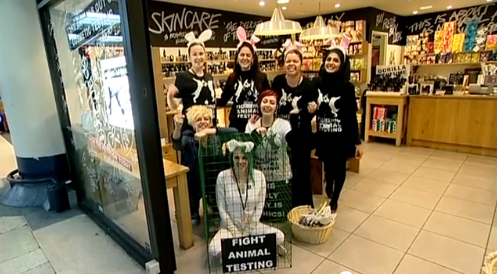 A tough-to-watch, controversy-stirring videotaped event by Lush Cosmetics in the U.K. involved a performance artist undergoing animal laboratory tests in the window of Lush Regent Street London in April to raise awareness of their fight against animal testing in cosmetics. Intended to shock, thousands of passerby signed the brand’s petition on the spot, while the performance was also streamed live on a website where viewers could sign. “I hope it will plant the seed of a new awareness in people to really start thinking about what they go out and buy and what goes into producing it,” said Traides. Cal a spade a spade and I call this a publicity stunt. And, I bet they sold more product..
We suspect this campaign was designed to position the brand as one against animal cruelty, intended to shock the public, garner publicity, make a brand statement and ultimately make $$. Do you think it was a successful approach? Next Next post: Let’s Make Today Great- Really?